TMJ disorder, also referred to as TMJ syndrome or TMD, is a condition characterized by misalignment of the temporomandibular joint (TMJ) and dysfunction of the muscles and nerves that surround it. The TMJ is the joint that connects the lower jaw to the skull on either side of the head. The symptoms of TMJ disorder may remain localized at the jaw or extend to other areas of the body. Problems with the TMJ are fairly common due to the complexity of the surrounding musculature and nerves, as well as the amount of daily articulation and force the joint can endure. Furthermore, injury to the TMJ or any attached structures can disrupt optimal function, leading to uncomfortable and bothersome side effects. It is estimated that millions of people suffer from TMJ disorders. At the Fawcett Center for Dentistry, P.A. our experienced dentist, Wayde Fawcett, DDS, offers effective treatment options that can help patients achieve comfort and restore proper TMJ function. Why Does TMJ Disorder Affect Other Areas of the Body? Will TMJ Disorder Go Away On Its Own? If you are experiencing these symptoms, it is important to get evaluated for TMJ disorder. 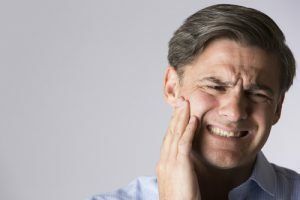 Without treatment or enacting lifestyle changes that can provide relief, serious problems can develop, such as degeneration of the TMJ or permanent damage to the teeth. When one area of the body is injured or malfunctioning, oftentimes other areas of the body work harder–and sometimes irregularly–to compensate. Problems with the TMJ are no different. When the muscles surrounding this joint are imbalanced, the neck, shoulders, and back may become misaligned as well. Without prompt treatment from a dentist experienced in TMD treatment options, problems that begin with symptoms of localized discomfort at the jaw may eventually lead to pain in other areas of the body. It is highly unlikely that TMJ disorder resolves on its own. In fact, the symptoms typically become worse as time progresses without treatment. If you believe you or a loved one may be suffering from TMJ disorder, scheduling a consultation with an experienced dentist and receiving a proper diagnosis is the first step toward finding relief. Early diagnosis and treatment can effectively restore proper function of the TMJ, allowing you to move your jaw with comfort and ease. Secondary symptoms, such as headaches, neck pain, or back pain, should also dissipate over the course of your TMJ disorder treatment. The type of treatment Dr. Fawcett recommends will depend on the nature of your TMJ disorder and the symptoms you are experiencing. In order to properly diagnose your condition, Dr. Fawcett will utilize 3D scans or digital x-rays of your jaw, and perform a thorough dental examination. Once he has gained a comprehensive understanding of the complications that are occurring, he may recommend anti-inflammatory and/or muscle relaxing medications, or customized oral devices designed to align the jaw and reduce nighttime grinding. If your TMJ disorder is determined to be severe, Dr. Fawcett may be able to suggest an experienced physician who can provide more advanced methods of treatment. If you think you may be suffering from TMJ disorder, please contact the Fawcett Center for Dentistry today. Dr. Fawcett can evaluate your condition and discuss possible treatment options that can reduce the symptoms of this common affliction.